The Ancestry Insider: Mormon angry at Ancestry.com? Your blog entry mentions your anger and frustration with Ancestry.com. While we share some of your frustrations, there are a number of inaccuracies in your statement that should be corrected. Some of your statements frustrate us. "[Ancestry's] owners sold their business"
This is not true. Ownership has not changed by more than a few percentage points. See our article about Ancestry's ownership. "[Ancestry] failed to work out an arrangement with the LDS Church"
"[Ancestry] cut off all church family history centers from the service." "[After canceling my subscription I can only] browse my already-entered family tree"
This is not true. We understand you should still be able to add, share and modify your tree. We do share your frustration that you can't access the records you attached to your tree while you were a subscriber. We understand Ancestry is working on this problem. "3-day [free] subscription if I'll agree to pay them..."
This is not true. We understand you can cancel after the 3 days with no further obligation. And if you were a new subscriber, you could get the 3-day subscription without entering a credit card number. Unfortunately, word has it that Ancestry has moved back to the 7-day trial requiring a credit card. If you don't cancel at the end of the trial, your credit card is charged. "...[after canceling my subscription] it won't let me download the GEDCOM file..."
This is not true. No wonder you're so angry! We hope Ancestry will never make this mistake. We think you may have fallen victim to a mistake they have made. We think Ancestry has done a poor job of designing tree management. Consequently, tasks are scattered about and often move or change. At the time of this posting, this is how you download a GEDCOM file: Click on the Home tab. 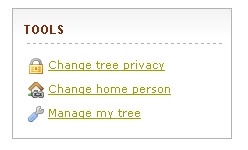 Near the bottom right of the page, click on Manage my tree. What did Ancestry do with the "Download GEDCOM" option?!? Near the middle of the page, click on (export tree). After the GEDCOM is prepared, you will see this message and the (export tree) link will change to (download GEDCOM). Click it or the link in the green box. "do my research ... the totally free way"
Unfortunately, someone must pay. In the case of the free services of FamilySearch.org, LDS Church members donate the millions of dollars that the Church spends to provide those services. (The rest of us thank you!) If you are a member of the LDS Church, you should expect to be asked to pay hundreds of hours during the remainder of your lifetime doing FamilySearch Indexing, paying the price so people you aren't related to can do their genealogy. (Again, we thank you!) Many, many people outside the LDS Church spend millions and millions of hours and dollars doing genealogical research and freely sharing their results with the rest of us. As a community of genealogists, we are all in this together. When someone aligns with the LDS Church and then posts unprofessional, inaccurate rantings, then people form lower opinions of the poster and the LDS Church. Less money and less volunteer hours are given. Again, the genealogical community suffers. Lillian, we're glad you're part of our community. We wish you all the best. After all, your successes are ours. I didn't read Lillian's post until reading this, but my perception of Ancestry just went down, purely through reading your article. Exposing another blogger who is frustrated with your service is no way to satisfy a customer. Thank you for this information. It's always good to learn more. I would like to point out that I'm not nearly as frustrated/angry with Ancestry.com as I am frustrated with the fact that I don't personally have access to it any more without paying out a bunch of bucks. In other words, I'm cheap and lazy, and it's so easy to slide into total hatred and frustration when something requires money and/or exertion. See my further, long-winded counter-comments here! Oh what fun! My service? Lillian isn't frustrated with my service; she's frustrated with Ancestry's. Thanks for reading our response and responding thereto. With your clarifications, we are in close agreement... well, at least until you scored us 1 out of 7. Ouch!! I am on my second paying year with ancestry, though I probably could just buy a month here and there.